This pattern is available for $1.99 USD buy it now. Get ready for winter with Snowy the Snowman! This is a great stash buster and a quick holiday present! He is knit in the round in one piece and is self standing. Finished snowman measures 4.25” tall. yarn. It’s a warm and cozy sweater to wear on a cold and blustery day! the mittens, check out the matching Kitten Hat in my Ravelry store. check out the matching Kinittin' Kitten Mittens in my Ravelry store. close to each other on the color wheel. I hope you enjoy this pattern! details. The pattern is great for a knitter who is ready to try lace knitting, but doesn’t want to commit to a shawl. One size fits all. 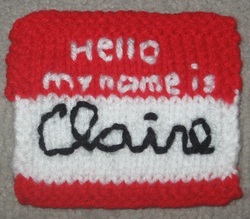 This pattern is available for $3.99 USD buy it now . He smokes, drinks, bites his toenails in public and tends to leave on adventures. He is a bad hobbit with bad habits! He is mister personality in the shire! 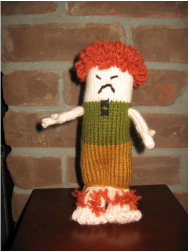 He is a fun quick knit and definitely a conversation starter!